Promises of “A new you for a New Year!” and enthusiastic endorsements for the fastest-growing weight loss method, bariatric surgeries, make it easy to get caught up in the excitement and to believe it will work for you, too. But this isn’t about a diet that you can abandon when you realize it’s just another scam. It’s a for-life decision that could cost you your life. So it’s all the more critical to know the facts. In its role of protecting the public, the FTC uses specific criteria to judge the truthfulness and accuracy of weight-loss advertising and marketing claims, and to differentiate them from exploitation. Those criteria include reliable scientific evidence to support claims of effectiveness, not making spurious and implausible claims that products are effective for long-term weight loss or that they reduce chronic diseases and extend life, not using testimonials and paid spokespersons, and avoiding misleading before-and-after photos. But as we’ve seen, when vested interests have encumbered the agencies we believe to be looking out for our interests, even the most well-intentioned, good-sounding criteria cannot protect us. It’s up to us to take an extremely critical eye to everything we hear and to seek out the most credible information. Regardless of the source — doctors and surgeons, patient groups, hospitals, insurers, government agencies, books and magazines, the internet or television — all bariatric information deserves close scrutiny. There is so much money involved, that it takes an especially strong skepticism to sort through all the marketing. Bariatric surgeries have been described as a “gold rush in medicine” because they’re one of the most profitable medical procedures done today, according to Dr. Edward H. Livingston, M.D., professor of surgery at the University of Texas Southwestern Medical Center in Dallas. Last year it was a $7.8 billion dollar industry and enjoying exponential growth, increasing some 1100% since 1995. It can be easy to forget that healthcare is BIG business and uses the same sales and marketing tactics of other product or services. When separating marketing from impartial health information, as the FTC criteria emphasize, the first step is to watch out for efforts to manipulate your emotions: inspirational and motivational success stories and testimonials, or frightening and threatening statements about deadly diseases for which they can offer a cure. The bariatric surgery information reaching consumers is decidedly slanted to paint an upbeat picture, even when it might seem to be providing balance. Success stories and testimonials are common and epitomize those FTC cautionary criteria. This marketing tactic alone is a huge heads-up that really this is mainly about looks. The most known example is, of course, Carnie Wilson, who has been a paid spokesperson for the bariatric surgery industry since her own surgery was broadcast on the internet in 1999 and her early testimonials with SpotlightHealth proved phenomenally successful for the bariatric industry. She also had an infomercial during 2005 which aired on Lifetime cable network and has a new one already airing that can be seen at LiteandHope.com. The bariatric industry produces countless publications, some made to appear as consumer and patient advocacy magazines, and even professional journals (such as Bariatrics Today, Obesity Research, Obesity Surgery Including Laparoscopy and Allied Care, and Surgery for Obesity and Related Diseases). Those geared to prospective patients are filled with before-and-after success stories, such as WLS Lifestyles, which has a special interview with Surgeon General Richard Carmona in the latest issue; and a bariatric center e-newsletter which has included “success stories” of 12 year old children. And success stories are displayed prominently on informational websites, such as for Allergan, Inc., manufacturer of LAP-BAND® Adjustable Gastric Banding System; for Ethicon Endo-Surgery, Inc., a Johnson & Johnson Company and bariatric surgical equipment supplier; and on most bariatric surgeon practice websites, for example here, here and here. Some more insidious convivial marketing tactics are on the internet through support groups, message boards, forums and chat rooms, and were discussed here. Personal stories add that human, emotional touch, but they are also the most subjective and least reliable sources for information available. As we learned here, beliefs are powerful and can lead us to incorrectly interpret our experiences. And when someone has come to believe in and wants desperately for somethingto work, especially when surrounded by people talking about how wonderful the surgeries are, they may not admit the full reality of the negatives. What matters most to prospective patients and their families is if these surgeries are effective in actually helping people live longer, healthier lives. They’ve been endorsed by the National Institutes of Health, World Health Organization, American Obesity Association, American Heart Association, American Society of Bariatric Surgeons, and Shape Up America! as “the best option for people who are severely obese.” So most people assume they’ve been carefully evaluated and proven to save lives. The Agency for Healthcare Research and Quality’s Evidence Report “Pharmacological and Surgical Treatment of Obesity” noted that randomized controlled trials or controlled clinical trials of these surgeries are so few in number and short-term that the available studies couldn’t be used to make inferences about efficacy. No study to date has compared bariatric surgeries to conservative clinical management of health problems facing patients and found the surgeries to be superior for life expectancy or for improving actual health outcomes. A landmark report evaluating the evidence (more than 70 studies) on the efficacy of bariatric surgeries was released by ECRI in September, 2004. ECRI (formerly the Emergency Care Research Institute) is a nonprofit health services research agency and a Collaborating Center of the World Health Organization. It is designated as an Evidence-based Practice Center by the U.S. Agency for Healthcare Research and Quality. ECRI’s mission is to improve the safety, quality and cost-effectiveness of healthcare. It is widely recognized as one of the world’s leading independent organizations committed to advancing the quality of healthcare. Looking carefully at these reviews examining the soundness of the evidence reveals findings very different from the promising things we hear and may have come to believe. That’s because glaring flaws are the norm among bariatric studies, although they’re rarely spoken of. That means, bariatric studies require us to look especially close. The strongest evidence used in support of bariatric surgeries during lobbying efforts to get Medicare coverage was a study published in the October 13, 2004 issue of JAMA. Its methodological problems — as described in a critical review here — are characteristic of bariatric studies, including those that have been published since then. · Most studies only report short-term outcomes, before long-term complications and the inevitable weight regain manifest themselves....even though weight regain is well known among weight-loss researchers for all weight-loss interventions. The first five post-op years, when weight loss is most dramatic, are known as the “honeymoon period.” Most bariatric studies last under 2 years. · To show the results of the surgery patients in the most favorable light, they are often compared to a control group of hospitalized, very ill fat people (rather than actual average people), or of older or poorer ones. · The studies universally measure “successful” outcomes by using proxy measures for disease risk, not actual incidences of disease. These are called “false surrogate endpoints.” When a treatment claims success because it lowers some believed health indice like weight, blood sugar, cholesterol or blood pressure, but fails to tell you that more people actually died after the “treatment,” then weight, blood sugar, cholesterol or blood pressure are “false surrogate endpoints.” It is well known that many life-threatening conditions — such as cancer, severe illness, intestinal parasites and starvation — can result in dramatic weight loss. But no one would argue that those are healthful! 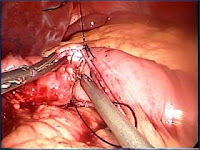 · Bariatric surgery is no different. It said to resolve “comorbidities associated with obesity” and “cure” diabetes, high cholesterol or high blood pressure. There again, they’re measuring the temporary drops in blood sugar, serum cholesterol levels and blood pressure that occur during any period of calorie restriction, starvation and weight loss, not actual diseases and health outcomes. · Typically not revealed is that those “healthful” trends in health risk indices after bariatric procedures, and other weight-loss measures, are generally not maintained. It has been well documented that those measures (blood pressure, cholesterol, weight, etc.) rebound over the long-term, often to higher levels than they were prior to the weight loss. · Like the JAMA study, complications are often not factored in the risk-benefit considerations or are significantly downplayed in most research. Hence, the information does not reach consumers in a real way or get entered into public debates. [After trying unsuccessfully for years to get countless articles published describing the lives of surgery survivors and the complications, risks and precautions; especially the special risks for women of childbearing age and growing children; it became apparent to me that mainstream media’s interests are not neutral.] These complications are too extensive to discuss here but objective reports show them to be much more extensive and prevalent, and to increase over time, than many prospective patients believe. Patients facing overwhelming complications can sometimes only rely on each other for help. Complication rates are also much higher than the immediate post-op problems reported in most bariatric studies because most occur after patients leave the hospital and are rarely connected with the surgeries. Actually, the risk of dying from these secondary operations is 3 to 6 times higher than for the initial surgery, according to the American Society of Bariatric Surgeons and Erik Wilson, M.D., assistant professor of surgery at the University of Texas Medical School in Houston. Of greatest concern are the effects of long-term nutritional deficiencies, which are rarely discussed realistically. The neurological decline and aging seen after bariatric surgeries is especially rapid and results from multiple vitamin and mineral deficiencies, said Dr. Ernsberger. Both the stomach and small intestines are critical for absorbing many nutrients, including B-vitamins, calcium, iron, vitamin D and protein. Even taking supplements in multiple times the recommended amounts doesn’t help because the surgeries eliminate the proper function of the stomach and gastrointestinal system, he said. Hence, malnutrition problems are not uncommon, according to the National Institute of Diabetes and Digestive and Kidney Diseases and include anemias, osteoporosis, loss of teeth, blindness and, in a reported 16% of cases, even neurological and brain damage. We are seeing the return of nutritional deficiency diseases of starvation in formerly healthy fat people that had become rare in Western societies and are typically only seen in underdeveloped regions of the world. Most bariatric patients are subjected to a lifetime of severely calorie-restricted diets and are unable to eat a full variety of foods, with average calorie intakes under 1,000 calories the first year and after three years the average is still 1,386 calories. The unhealthfulness of long-term starvation-level diets (even uncomplicated by malabsorption) and protein shortages have been well proven to significantly shorten people’s lives. Vomiting after gastric bypass procedures occurs in up to 68.8% of cases and can become chronic, resulting in severe malnutrition, according to Brazilian surgeons in a 2005 study published in Obesity Surgery. Their study found weight loss was 10% higher among patients who become chronic vomiters. The insurance companies are not denying coverage for bariatric surgeries because they are “discriminating against fat people” or too cheap to pay for a “necessary medical treatment.” It is because they see first-hand how many patients are suffering serious complications, are requiring more surgeries, more hospitalizations, more medications and dying afterwards. Patients and consumers are led to believe that risks are a function of the surgeon’s and medical facility’s experience, which is only partly true. Undeniably, it is the surgeries themselves. Other claims of the surgeries’ benefits cite beliefs that the surgeries reduce healthcare expenditures but that has never been shown in careful studies, either. In fact, hospitalizations more than double for most patients after having the surgery. A 2005 study of nearly 61,000 patients who had gastric bypass in California from 1995 to 2004 found that 19.3% were hospitalized during the year following their surgeries, mostly for surgery-related complications, such as infections, hernias and bowel obstructions. Most notably, their hospitalizations after bariatric surgeries were more than double the 7.9% hospitalization rate the year prior to having the surgery. A subset followed for three years showed their hospitalization rates were 18.4% during the second post-op year and 15% in the third year, still much higher than they ever were before their surgeries. Bariatric surgeries clearly do not mean better health for most patients. In the cost savings claims, the costs of the surgeries themselves are also often underquoted, such as the $17,975 figure argued by Utah Representative Steve Mascaro who has drafted a bill to mandate coverage for the surgeries by insurance companies in Utah. The Pennsylvania Health Care Cost Containment Council, for example, analyzed the actual total hospital costs of their state’s bariatric patients in 2001 and found that 39% of the patients require hospital readmissions... at an additional cost of $21,524 each. That’s over and above the average hospital costs for the initial surgeries of $35,643, making average total hospital costs over $44,000 apiece. Actual mortality figures after bariatric procedures can be hard to find, as most data only report deaths during the few post-op days in the hospital or within the first 30 days. The information also comes from the bariatric industry which, as has been noted, only reports on a small percentage of patients and most deaths are not attributed to the surgeries. Even so, based on studies of nearly 63,000 operations presented at the American College of Surgeons 2003 Clinical Congress, surgeons reported that an average of 2% of patients die within the first 30 days as a direct result of their primary surgery, but rates were as high as 6% with some surgeons and medical centers. Other surgeon reports have found mortality rates are three times higher in patients over age 55, three times higher in African Americans than whites, 2.8 times higher for men than women, and highest among patients who are the most “obese” (up to 12.5 times higher for laparoscopic gastric bypasses) — the very patients the surgeries are supposedly to help. The most objective mortality data available to date was in a study published in JAMA, led by Dr. David R. Flum, M.D., MPH, of the Department of Surgery at the University of Washington, Seattle. They looked at actual 1-year death rates for all Medicare beneficiaries who had had bariatric surgeries in Medicare-approved centers from 1997 to 2002. Of the 16,000 patients, with an average age of only 35-54 years, death rates at one year averaged 4.6%, but among patients 65 to 74 years old, nearly 13% of the men and about 6% of the women died. In patients 75 and older, half of the men and 40% of the women had died. To put these numbers into perspective, by comparison, a coronary bypass has a 2.6% mortality rate, yet those are mostly done on elderly patients who are seriously ill with multiple health problems. It’s important to realize that most of these gastric bypasses — 85 percent — are done on young women of childbearing age, according to Dr. Edward E. Whang, M.D. of Brigham and Women’s Hospital in Boston. Such high surgical risks are not found in other elective procedures done on such relatively young patients, regardless of their weight. “In a series of over 2,500 appendectomies, there was not a single death in anyone under age 50, even with emergency surgery on a burst appendix,” said Dr. Ernsberger. But before anyone can really make an informed decision to have the surgery, they need the most objective, credible and comprehensive information on their actual risks. Researchers in Boston reported on best practice guidelines for informed consent for bariatric surgeries in a recent issue of Obesity Research. After reviewing the scientific literature on informed consent between 1984 and 2004, they found none were based on empirical studies. There is “limited legal requirements” in the informed consent process and no state requires that patients demonstrate actual understanding of what they are agreeing to. The promises of hope for a “new life” and assurances that the risks are worth taking, lead many to believe that they’ll be one of the lucky ones and that the bad outcomes won’t happen to them. It’s easy to get swept up in the emotion and desire. But please, if you are considering a bariatric procedure, take the time to be your own FTC and look for the signs of fraudulent marketing. Seek the most accurate and true information, not just from sources with something to sell. And make sure that you and your loved ones know all the facts. ATTENTION: The latest outcome figures, as well as more information on bariatric surgeries, can be found in the bariatric series listed on the sidebar to the right.